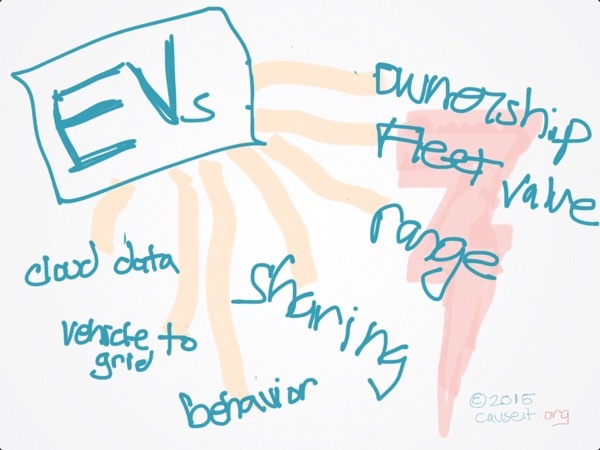 Cleantech Forum SF 2015 (Running Notes) — Causeit, Inc. So far, a great day here at the Cleantech Forum 2015. I'm seeing lots of great startups and committed corporates trying to connect the dots between old-school energy issues and new-school, software-driven solutions. Of particular interest is the marked contrast in marketing ability of the hard-tech, hard-science folks and traditional utilities, and the more software-focused startups. The story of new innovations is sometimes far more compelling from the startups and scientists, but the corporate line-of-sight to bottom line issues such as regulation and time-to-maket is remarkably clear from the utilities. Both have a lot to learn from each other about a clear story of both the new possibilities of innovators, and the pragmatic credibility of larger firms. Fortunately, firms like RWE, PG&E and Autodesk are helping to bridge the gaps between those discussions of new innovations and incumbent business models. Top sessions for me from the day include the Automotive and Manufacturing sessions, where startups and VCs paired up with incumbent players to explore the problem space of several key challenges. The value chains in these realms are incredibly complex, and few startups are able meet the complex challenges of hardware-heavy industries. Fortunately, everyone I saw on stage did a great job of answering the challenge questions from investor panels and the audiences. I've attached a few sketches of the problem spaces from the sessions for your commentary, and I look forward to reporting back with more tomorrow!